Author: Altman, John Set In . . . Description: An ordinary woman is caught in extraordinary circumstances, in the crackling new thriller from a major new talent. John Altman's first two suspense novels won remarkable praise. Now, Altman gives us his best yet. Hannah Gray is on the run. Unwittingly involved in an insurance fraud, she's leapt upon a friend's offer of tickets to an Adriatic cruise just to clear her head and figure things out. Maybe the fraud has been discovered-or maybe the threat of exposure exists only in her mind. Couldn't it be? But on the ship, she meets Renee Epstein, and that's when her life changes. Renee's husband is a scientist, and he's on the run himself. He's taken off with equations about to be used for a purpose he had not at all intended, but while he's trying to figure out what to do with them, he's scribbled them on the flyleaf of a book. And now his wife has given the book to some fool woman she's met on the boat. Before he can retrieve it, the Epsteins are murdered, Hannah herself is targeted, and an extraordinary adventure begins through the Greek islands and Turkey, as Hannah Gray must use all of a hitherto-unsuspected resourcefulness to battle her way through a situation that only becomes more perilous by the minute. 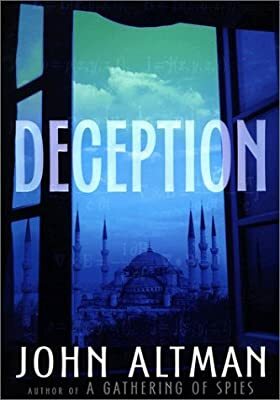 Filled with vivid characters, breathtaking suspense, and delicious atmosphere, Deception is indeed what thrillers ought to be and seldom are.